Basement Waterproofing and Crawl Space Book! 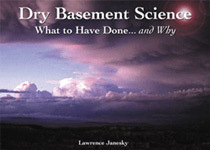 This 88-page, full-color book, written by Larry Janesky, founder and owner of Basement Systems, Inc. covers all the problems with basements, including waterproofing, sump systems, moisture, mold and mildew, repair costs, etc. -- there's even a section on crawl spaces! This book helps you become more knowledgeable about your basement and informs you of the necessary steps to solve your basement problems. You can purchase Dry Basement Science at Amazon.com or get it through one of our Basement Systems Dealers when you get your free basement waterproofing estimate.